Born at Faucon, Provence, on June 23, he was educated at Aix, but on his return to Faucon lived as a hermit for a time. 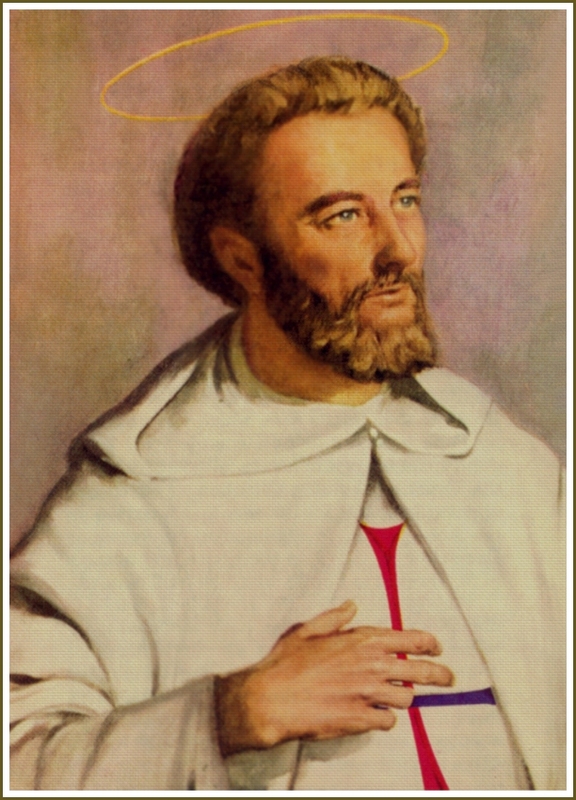 He then went to Paris where he received his doctorate in theology, was ordained there in 1197, and then joined St. Felix of Valois in his hermitage at Cerfroid. He confided to Felix his idea of founding a religious order to ransom Christian prisoners from the Moslems, and late in 1197, the two went to Rome and received the approval of Pope Innocent III for the Order of the Most Holy Trinity (the Trinitarians), with John as superior, in 1198; they also secured the approval of King Philip Augustus of France. The Order flourished, spread to France, Spain, Italy, and England, sent many of its members to North Africa, and redeemed many captives. St. John died at Rome on December 17, and his cult was approved in 1655 and again in 1694. Holy Trinity: Father, Son and Holy Spirit, Thou didst call John De Matha to be a liberator of those who suffered the pains of captivity. Through his intercession, give patience and love to those who are persecuted for their faith in Christ; bestow Thy liberating grace on all who are enchained by any form of addiction; and instill a sense of purifying purposefulness in all who serve time in correction institutions. Holy and Blessed Trinity, instill in my heart and in the hearts of all who are associated with the Trinitarian Order that love which moved John de Matha to labor for the spiritual and physical freedom of all Thy sons and daughters. Instill in us a deep compassion for the poor and the less fortunate of society, and transform us into apostles of Thy kingdom of justice and peace in our world. We ask this, Trinity Most Holy, because Thou art at once our loving Father, our compassionate Redeemer, and the Spirit from Whom all blessings come. Amen. Holy Founder, John De Matha, the loving plan of God has willed that we be thy spiritual heirs. Protect us and all members of the Trinitarian Family. Obtain for us the grace to be filled with thy dynamic love for God-Trinity and a deep compassion for suffering humanity. May thine example inspire us to live a personal and social life which is rooted in the Gospel and exemplifies the love and unity of the Holy Trinity. May thy redemptive spirit animate us to imitate Christ the Redeemer, and uphold the freedom of all people, especially those who are marked with the hardship of the human condition. May our commitment to the ideal of Christian love bring us, one day, to enjoy with thee the beatific vision of God-Trinity. THE THIRD ORDER OF THE MOST HOLY TRINITY is an association of lay persons who, inspired by the example of St. John De Matha, enrich their Christian life with a special devotion to the Most Holy Trinity and a great compassion for the poor, the sick and the imprisoned.